A new grand-nephew was added to the family a few weeks ago. I thought about making him a quilt, but realised there were others ahead of him who were yet to receive quilts. I think my average completion time for a quilt is about 4 years, but it's amazing what you can do when you put your mind to it. This quilt, by Pinetree Lodge (https://www.etsy.com/au/shop/pinetreelodge) was my original inspiration. I really like the monochrome colour scheme and highlight of the white. 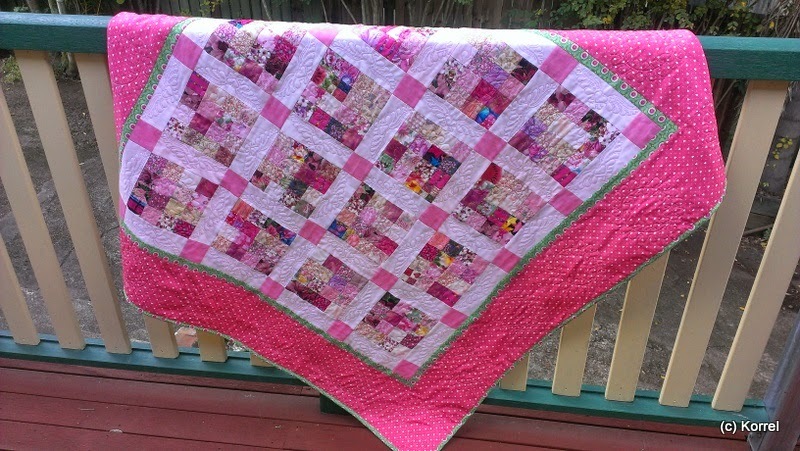 I planned to make the same quilt, or similar, in pink and white. 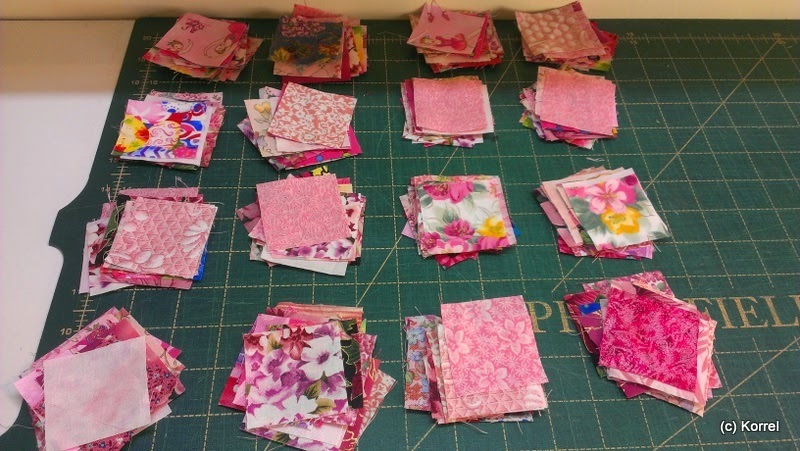 However, when I dug through my collection of scraps, all nicely pre-cut into 5, 3.5 and 2 inch squares, I found I had very few 5 inch pink squares. I'm not really fond of pink. I've used bits of it here and there, but the dozen or so pink charms I had simple weren't going to be enough. I toyed with the idea of 9-patches, instead of single charms. Although I had plenty of 2 inch charms, I had lots of some fabrics, and only one or two of others. I needed at least four or five of each fabric for 9-patches. Someone suggested 16-patches. 16-patches can be more random in placement. 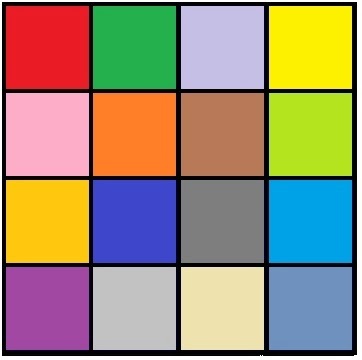 A four x four arrangement of 2 inch squares creates a finished 6 inch block, which is a nice size to work with. 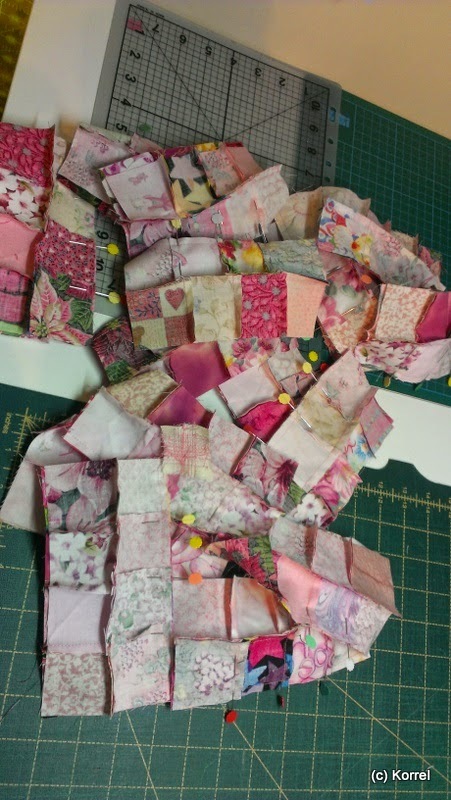 The quilt started with digging out all my pink or part pink charms. I sorted them by fabric type, then distributed them into 16 piles of 16 fabric. No fabric is repeated in any pile. A couple (just one or two) fabrics appear in every pile; some only appear in one pile. 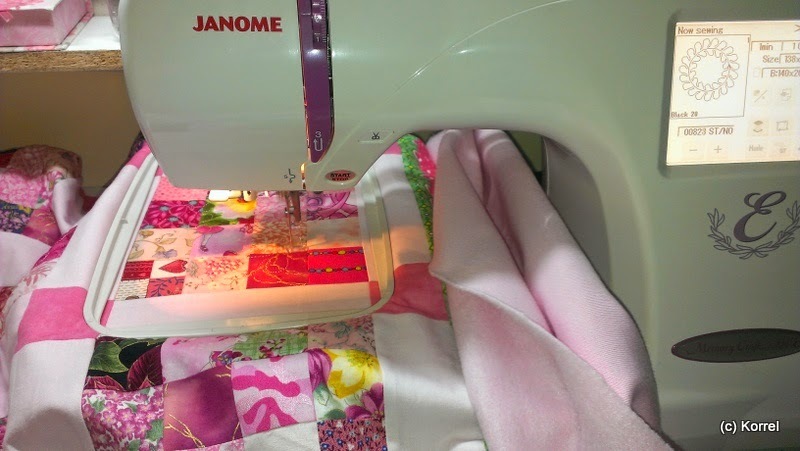 Someone once told me that the secret to a scrappy quilt is that fabrics need to be repeated. If you repeat some fabrics, you can sew together just about anything you like. And so far, it seems to work for me. Once I had my piles, I started chain sewing. I took a pile of 16 squares, and sewed them into twos, without snipping threads in between. I put a piece of scrap fabric through the machine and continued with the next pile. When all the charms were sewn into pairs, I cut my long string apart at the scraps and then cut each section apart. This kept me from muddling up my piles. 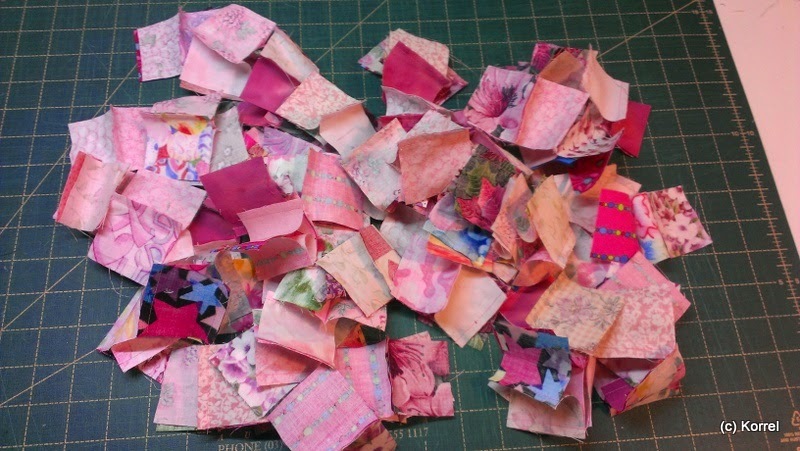 I then sewed my twos into fours; again, sewing a piece of scrap between the piles. Sewed my fours into 8s and my 8s into 16s. 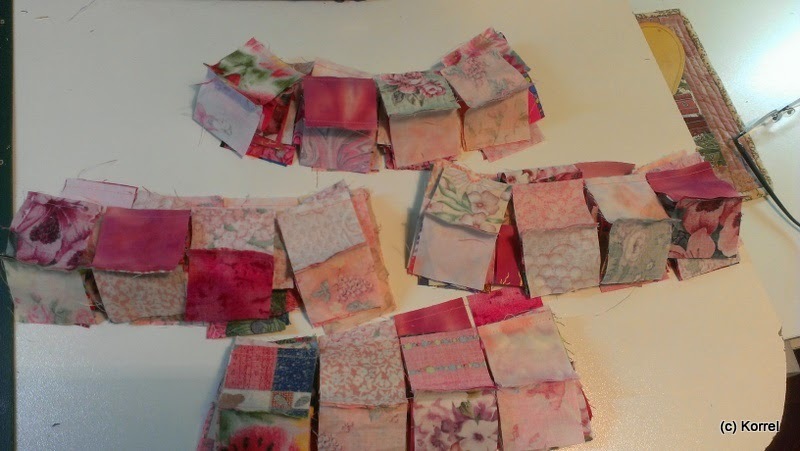 Digging through my scraps I found some pink homespun cut into binding strips. And I had enough to sash my 16 blocks. I didn't have enough to sash and corner stone the blocks, but I found a lovely piece of fabric with enough in it to cut cornerstones. In fact, I miscounted and cut twice as many cornerstones as I needed. There's forty sashing strips, but only 20 cornerstones. 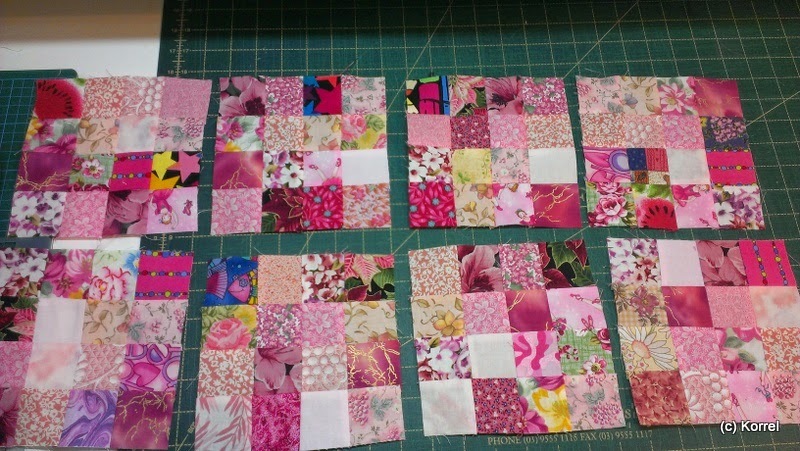 To sew on the sashings, I add sashing to one side of every block. For four blocks, I added sashing to two sides. I sewed my blocks together in four strips of four. I then sewed sashings and cornerstones together - five lengths of five cornerstones and four sashings. 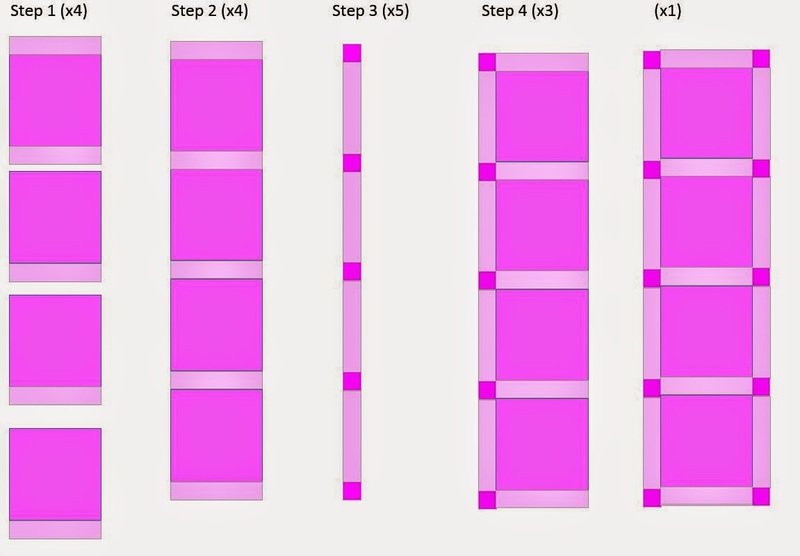 I sewed one of these lengths to each strip of blocks; and two to one strip. Then I sewed my sashed strips together. I toyed with various options for borders, and finally settled on adding a tiny spark of contrast. My first border was bright green, with pink highlights. The second border was a wide pink border. 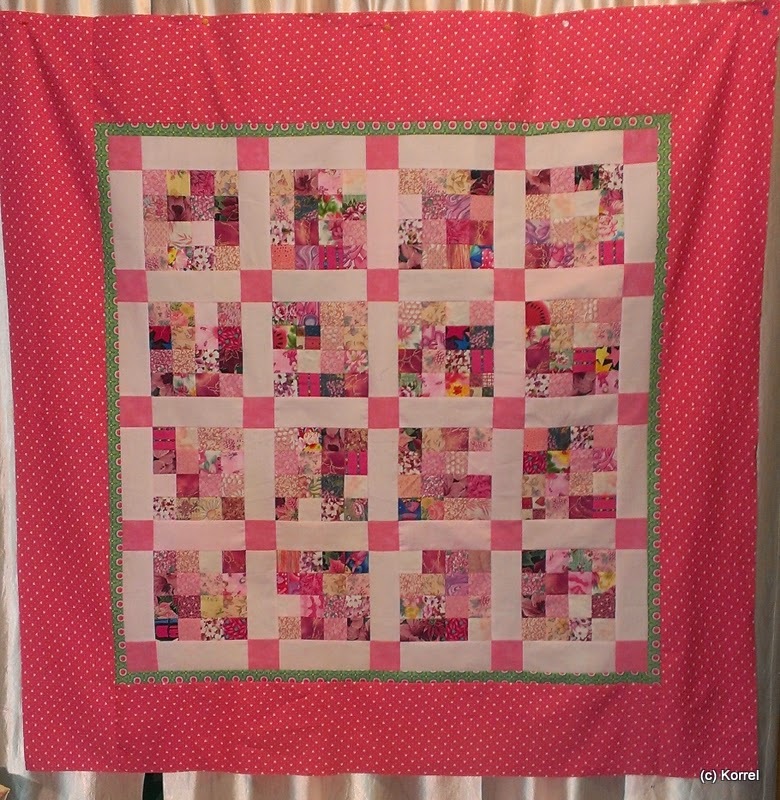 I did consider a pink first border, like the inspiration quilt, but decided it wouldn't work. The inspiration quilt didn't use cornerstones, which although small, change the dynamic of the quilt. The quilt wasn't quite as large as I had envisaged, but consensus on Facebook was that it was finished and didn't need any more borders. I decided to machine quilt it using my embroidery machine (the main reason I bought the machine). It's slow, it's a little tedious, but the results far outweigh anything I could do by hand or machine. In the centre of my blocks I used a feathered circle and in the sashings a feathered heart (best seen on the back). I backed the quilt with polar fleece, which doubles as wadding. Two layers are much easier to manipulate in the machine hoops. 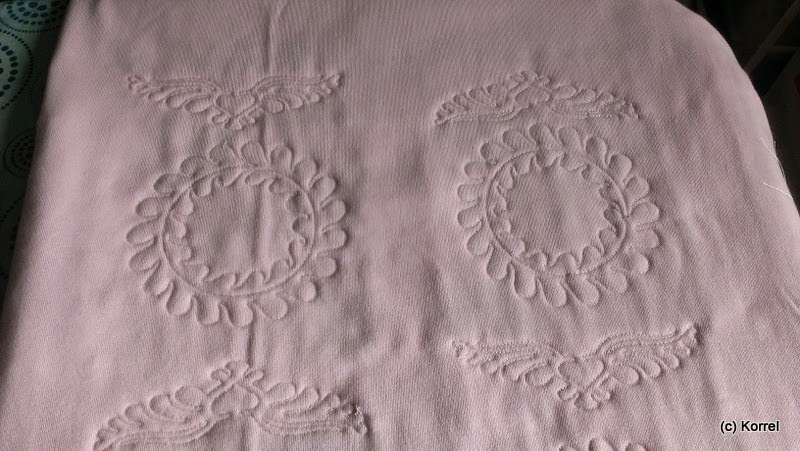 I surprised myself my not making a single mistake in the arrangement of the sashing quilting. The hearts are all alternating - both horizontally and vertically. I didn't want to create a "right side up". 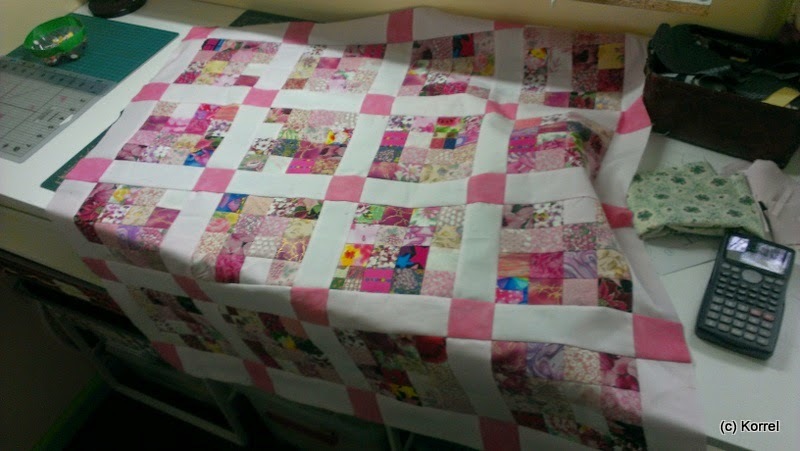 In the wide pink border I repeated the circle quilting, lining it up with the blocks. I could probably have repeated the hearts as well, but decided not to. 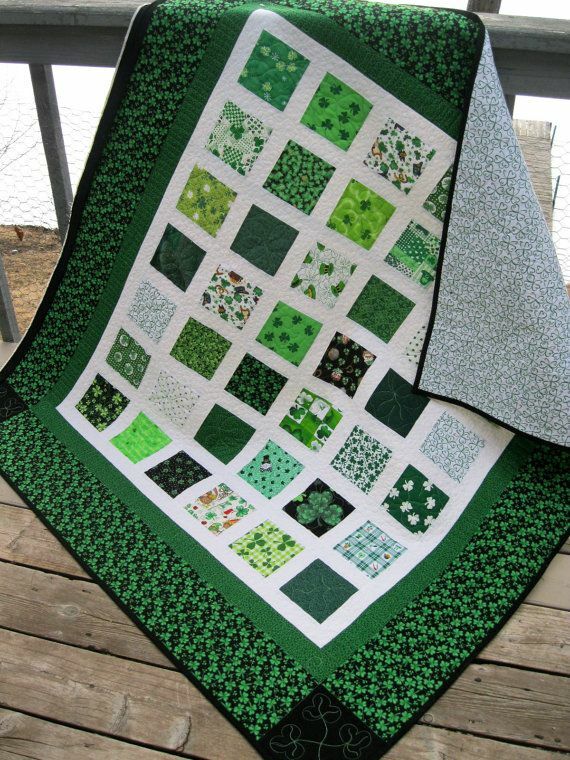 Finally, I sashed the quilt with the same green as the narrow border. I started the quilt on Sunday afternoon and posted it the following Monday. Waiting to hear that it has arrived safe and sound. Lovely quilt Sue like the pink tones.